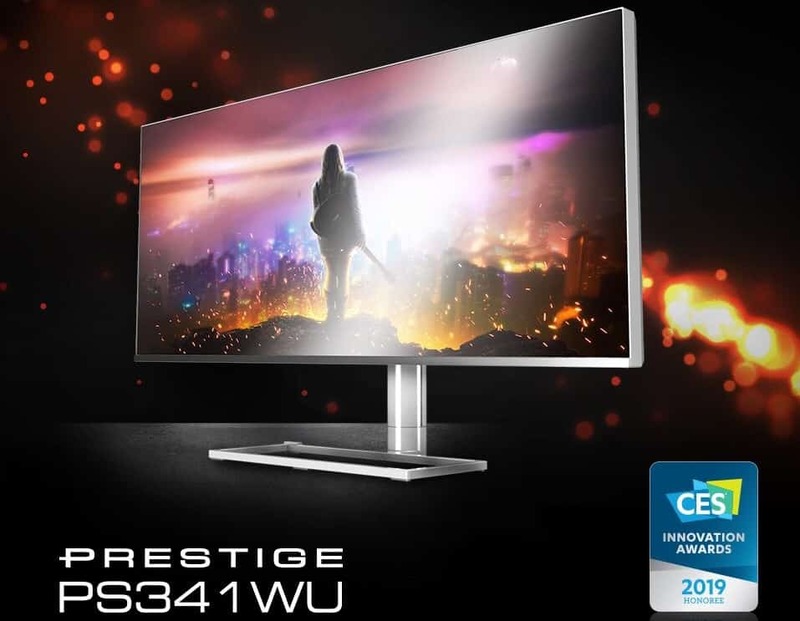 The MSI Prestige PS34WU marks the entry of the brand into the very competitive designer and content creator category composed of the best and brightest displays. MSI started this venture with their P-series laptops which are often offered in white and silver. The MSI Prestige PS34WU and the brand’s laptops that match make a very enticing package for designers, but does this new monitor have the right formula of capabilities? The MSI Prestige PS341WU sports a clean and sophisticated minimalist design that’s dressed to impress in white with silver accents. The shares identical aesthetic cues with the brand’s Prestige laptops which shy away from the black and red themes wit RGB lighting that are popular with the gaming variants. The monitor isn’t bezel-free, but the borders are designed to be thin enough and enable a maximized view. Final weight and dimensions for the MSI Prestige PS341WU aren’t available yet at this time. However, we can already tell that the monitor’s proportions will be modest to match clean builds or setups usually found in studios or offices. The MSI Prestige PS341WU includes a very flexible stand according to the visitors at MSI’s CES 2019 booth. The mechanism allows tilt, height adjustments, and swivel, which goes beyond the usual angles allowed by current monitors. The mount should also be removable in case users prefer an aftermarket VESA-compatible option. One peculiar characteristic of the MSI Prestige PS341WU is its rectangular base which has the center cut out. There was no word if MSI was planning to add a gadget that’s designed for the slot, although you can improvise and place sound bars or speakers in it. The design isn’t functional, but its a contemporary touch where its purpose’s limitations are dictated only by the user’s imagination. The connectivity layout for the MSI Prestige PS341WU matches its projected sophistication by offering the latest connector standards. The layout includes DisplayPort and HDMI for primary inputs, but there is also a USB-C slot for single cable operation. The device will have four USB 3.1 receptacles for a substantially faster transfer than the regular variants. The MSI Prestige PS341WU boasts a 34-inch Nano IPS panel with a 5120 x 2160 5K 2K resolution, 60Hz refresh rate, and a presumed 5ms response time. The contrast reaches 1200:1 as listed with Nano IPS monitors, but the maximum brightness is currently unknown. It also wasn’t mentioned if this model is HDR-compatible, although some of these characteristics hint at it. The possibility of the MSI Prestige PS341WU being HDR compatible is high because due to numerous factors. The Nano IPS panel used which we believe is made by LG is capable of fantastic vibrancy and accuracy thanks to its unique treatment. This model is advertised to reach 98% DCI-P3 for eye-popping colors which HDR certification requires. HDR compatibility is almost guaranteed if the MSI Prestige PS341WU has a high-ceiling backlight that can reach a minimum of 600cd/m2. A powerful WLED unit would be beneficial for this device since it already has extended contrast ratios and gamut coverages. Visitors to the MSI booth at CES 2019 mentioned that the screen is mighty crisp and colorful, suggesting that the retail version’s output will be substantially better than most ultrawides. The MSI Prestige PS341WU shares nearly identical specs to the LG 34WK95U we reviewed earlier since they most probably share the same Nano IPS panel. One of the immediately noticeable characteristics of the display type is its considerable crispness and detail. The sharpness we saw on the LG is comparable to Apple’s Retina display which is still widely preferred by designers. Gamers, on the other hand, will not favor this display because of its limited refresh rate and high pixel count. You are going to need flagship cards to run AAA games at high to ultra settings at this resolution, but we know it will still be difficult to achieve an enjoyable smoothness. Casual gaming shouldn’t be an issue especially if you prefer story-driven titles and their immersive properties. Gaming features aren’t part and parcel of the MSI Prestige PS341WU, but it should be FreeSync-compatible like the rest of the brand’s offerings. The Prestige line of laptops and pre-built desktops have gaming-grade GPUs after all, so it wouldn’t be surprising if the product has low latency at the least. The MSI Prestige PS341WU is an attractive proposition for a professional display from a brand that specializes in gaming-grade parts and peripherals. The refreshing design and the parameters of the Nano IPS panel will make this a competitive offering in the market when it arrives. MSI’s Prestige products are capable of excellent gaming experiences, however, the resolution and low refresh rate make this device less ideal. The MSI Prestige PS341WU is scheduled to arrive at retailers by the start of the summer of this year. The price is unusually high at $1799 at release, but we know that it will become more reasonable as stock normalizes. Keep checking this page for the latest updates or you can also check MSI’s website for the latest bits of info.